Buying a home for the first time is one of the biggest moments in a person’s life. It’s right up there with graduating from high school/college, getting married, and having a child. And like the rest of those moments, buying your first home is an exciting time. I know what you’re thinking. Finally! A space you can make your own. The way you want it. The way you envisioned. Maybe you wanted to tear up all the carpet in exchange for wood. Maybe you wanted to cut down some of those trees that are too close to the house. Or maybe you wanted to knock down that wall in the master bedroom and build a walk-in closet. 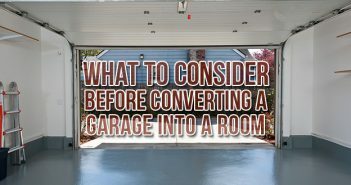 Whatever the case may be, here are five home improvement projects to help turn an ordinary home into your dream home. Don’t let the taste of others steer you away from purchasing your first home. That’s the beauty of buying a home. You get to make changes you want to make. Don’t like the lime green walls in the kitchen? Paint over it. Hate the way that shade of yellow looks in the upstairs bedroom? Paint over it. Can’t stand seeing … OK, you get the point. The fact of the matter is that a fresh coat of paint does wonders for a home, and it only makes sense to pick colors that you like. After all, it’s YOUR home. If you’re having trouble coming up with a color theme, check out the best and worst colors for each room in your home. All those years of helping your parents with yard work is about to be put to the test. That’s right! Buying your first home comes with your very own yard, and it’s up to you to take care of it. This is your chance to make it look the way you want it. Whether it’s adding flowers or trees, pruning those overgrown shrubs, or adding exterior lighting, landscaping is important because it can increase the value of a home. And, if done well, can be very appealing to look at. Be sure, however, to avoid these 10 landscape mistakes that can make your yard stand out – and not in a good way. If you’re planning a big landscaping project that requires the removal of asphalt, dirt, concrete, or more, a roll-off dumpster is perfect for disposing of yard debris. According to Rodney Gaumitz of Home Loan Investment Bank, most home buyers want to update flooring before moving in; “whether that be carpeting that needs to be scrubbed or replaced, or hardwood floors that look as though the previous owner’s cat used them as scratching posts.” Updated flooring instantly updates a home’s decor. The cost of carpeting depends not only on the quality of the carpet, but the design of it as well. Having carpets professionally cleaned is a cheaper alternative to replacing them altogether. Of course, if you have a steam cleaner, you could always clean the carpet yourself. If for some reason you have carpet in the kitchen like I used to have in my first apartment, just get rid of it. And since you bought the home, you have the option of doing just that. This doesn’t have to be a complete overhaul, if you don’t want it to, of course. Most people overlook the fact that a simple remodel to a bathroom can be inexpensive and done over the weekend. 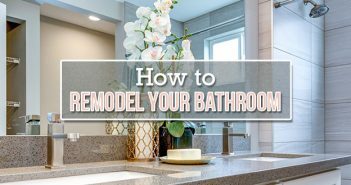 A complete bathroom remodel can costs thousands of dollars, and depending on your budget and your goals, you can go as little or as big as you want. For minor updates to a bathroom, consider a new shower head or a simple plumbing fixture, such as a faucet or a sink that can immediately change the look and function immediately. Replacing a leaky faucet or changing an outdated vanity are also quick and affordable options. 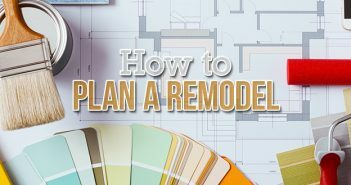 If you’re embarking on a bathroom remodel, which on average typically costs between $5,000-$13,000, there are some things to consider before doing so. One thing home buyers, especially first-time home buyers, don’t think about when purchasing a home is the lighting. It’s easily overlooked. Much like the color paint you choose can either make or break a room, so can the lighting in that room. Replacing old light bulbs with brighter ones can open and brighten up a room at the flick of the light switch. It’s amazing what track lighting or ceiling lighting can do to a room as opposed to a floor lamp.